better in the OpenSCAD source file. they make it. Any thoughts? I'm using 2015-3-2 on Windows 10. 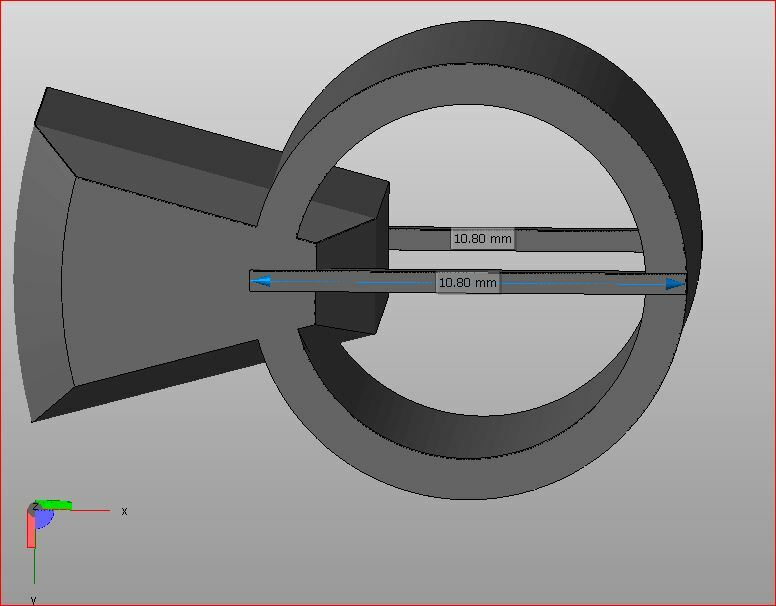 Netfabb says it is 10.8mm wide which is as you specified. I tried the stl file with Slic3r and all layers of vertical walls are equal. I used Repetier with parallel projection. Are you sure you are not visualizing it with perspective projection? And there you have it. Perspective projection. This still leaves me with prints that are wrong, but at least now I can view things correctly (thank you!). I now have NO idea why the prints are as they are. Tends to be a slipping coupling, pully or belt, if you print at slow speeds it is reduced; the jerk at high speeds shows it up. all axes. I will ponder further. Thanks! > it is reduced; the jerk at high speeds shows it up. Could be cumulative error due to a slight difference in step/mm calibration. > on all axes. I will ponder further. Thanks! >> it is reduced; the jerk at high speeds shows it up. and/or confidential and protected from disclosure. this message and deleting the material from any computer. Then your steppers are losing steps/skipping? pristine, so that is not the problem. How exactly are your prints not vertical? Are they slanted, growing bigger at each layer? Or what? Thanks for the thought, but in fact the remainder of the print is pristine, so that is not the problem. One small portion of the print has a vertical surface that is at a slight angle. The result is that a part that is supposed to mate with it fails to mate. The rest of the print is pristine. No pulleys. Lead screws. But thanks for the thought. I checked the stl file again with Repetier and there is no flaws like you mentioned. I would suggest you to print it again in another table position.